The name of this service is Best Essay Tips. It indicates that in addition to getting the papers you pay for, you’re getting something more: experience. That’s exactly what we expect from a high-quality writing service. Does this company deserve such a name? We had to check. Our team placed orders at the website, and the overall impression was quite positive. This is a very clean website that allows you to find the info you need without much trouble. It’s easy to find the list of services at the bottom of the home page. These are the main types of papers the company offers: admission essay, all other kinds of essay, research paper, process essay (this is not something you can find at many other websites, term paper, research paper, book report, and coursework. In the order form, you can see that the service offers several other types of content as well. Dissertations, theses, short stories, SWOT analyses, capstone projects, and marketing plans are also available. The website includes brief tips on how to write most of these papers. Even if you don’t plan ordering a paper here, we recommend you to check out those pages. The good news is that this company is more affordable than the average in the writing industry. The prices start from $13.99 and range up to $43.99. We have to say: that’s one of the most affordable price charts we’ve seen, if we’re talking about reliable services with good reputation among students. Are there any discounts? Before we get to that point, let’s pay attention to the fact that you’re getting free VIP support, proofreading, or one of the top 10 writers in the category with certain choices of deadline and quality level. Your first order comes with 25% off if you apply the discount code. That’s huge! Loyal users also get discounts, but they are somewhat lower – from 5% to 15%. 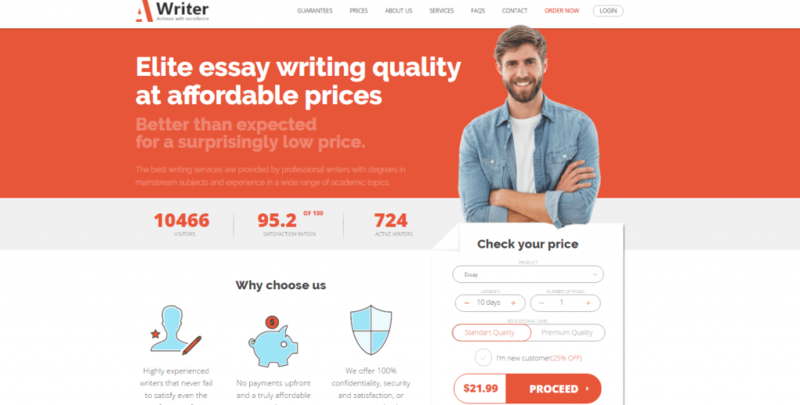 To be honest, we didn’t expect overwhelming quality given the fact that this is such an affordable writing service. We were in for a surprise. To test the service, we ordered a book review on Julio Cortazar’s Hopscotch. It’s not a book that everyone has read, so it’s a big challenge for a writing service. The service paired us with a writer with MA in literature. He was familiar with the book and he wrote an impressive review. He delivered the review on time and there was absolutely no need for revisions. We didn’t stop there. We also ordered an essay for sociology course. This time, we chose the Standard quality level, just to see how the writers perform when you opt for the most affordable level. The writer responded to our messages and made sure to follow the guidelines. We got a paper that was more than decent. For the price we paid, it was great. After that experience, the members of our team kept using the service for other papers they needed. The chat is available 24/7. We ordered the second essay in the middle of the night and we set a short deadline of 48 hours. The support agents convinced us that they had a suitable writer in their team. They were right. The support system was non-stop available and the agents were attentive to our questions. Phone and email contacts are also available at the site. BestEssayTips is a writing service with many advantages. It offers a learning experience, so you can benefit from its website even if you’re not a customer. If you decide to order a paper there, you’ll get a really affordable price when you compare it to the offer of top-ranked services. The quality we got was top notch. We’ve ordered few papers at the site and the team never failed us. One of the oldest sites on the market. Good price, good customer discount program, good quality as expected. We recommend this service.